In 2011 went to Candaba to look for this bird after some WBCP members reported a flock of 16 Pied Avocets. In the Kennedy guide, this bird is listed as rare. 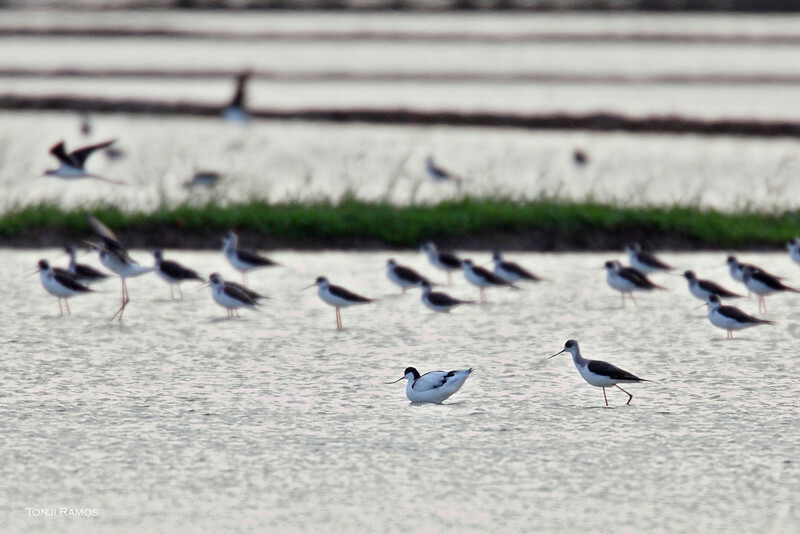 Before that flock was seen, there were only 2 other reports of Pied Avocets in the Philippines. They look very similar to the common Black-Winged Stilt. The beak of the Pied Avocet however is turned upwards. The Pied Avocet also has a black and white (or "pied") pattern on its wings. It is about 17" long. It is a migrant. We were surprised when we immediately found 2 Pied Avocets mixed in the first group of Black-Winged Stilts that we came upon. This was during the first 15 minutes of our birding day. We thought we would come across the flock later on in the day. However, we only saw 2 other Pied Avocets flying some distance away. We didn't see the flock and didn't get a chance to take better pictures. Our second time to see this bird was in Davao del Sur in 2014. It was spotted by Pete Simpson while we were walking along some fishponds. Like our first encounter it was mixed in with the Black-winged Stilts.